Last year I helped my friend and neighbor, Colin Bogart, who heads the City of Glendale’s Safe and Healthy Streets program, in tallying the intersection of Columbus Drive and Riverdale Avenue in that city for the Glendale Bicyclist and Pedestrian Count 2010..Armed with a clipboard I counted the number of pedestrians and bicyclists entering and leaving the intersection, organized into eight 15-minute intervals and listed by direction, noting other variables such as helmet-less riders, female cyclists, sidewalk cyclists, etc. This year I was willing to volunteer again, this time in a different setting. So I chose the busier intersection of San Fernando Road and Los Feliz Avenue, towards the southern end of town, to do the count between 5 and 7 p.m. This time I was joined by two other volunteer counters, Maria, who, like Colin is part of the Los Angeles County Bicycle Coalition, and Cindy, a Glendale resident who did the count last year. 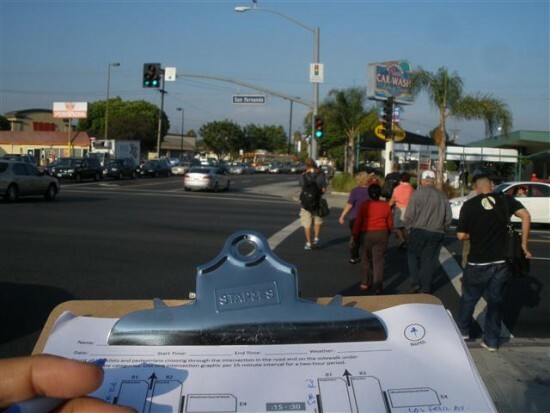 The purpose of the count is to provide statistical data for Glendale’s potential bicycle and pedestrian infrastructure and policy. I managed to ride in there after an 11-mile bike ride that started at USC, then ended in Atwater Village for my chiropractor appointment, and ended up in nearby Glendale where I went to do the count. While Maria and Cindy took the northeast corner, I was on the southwest corner, in front of the CVS Pharmacy and counted the east-west bike and foot traffic on Los Feliz. Having a number of busy bus stops made this intersection a hot one, though the westbound bike and foot traffic on Los Feliz – which led to the railroad underpass and hit the Los Angeles City limits – had a much smaller traffic volume than the other three directions. Since I had to rush over to my next destination in Downtown by bus just minutes after the end of the county, I wasn’t around for the final tally but gave Maria and Cindy my tally sheets, where they compiled the findings at the Starbucks in the nearby Vons Supermarket. I get to return to the intersection on Saturday, where I do the same thing between 10 a.m. and noon.